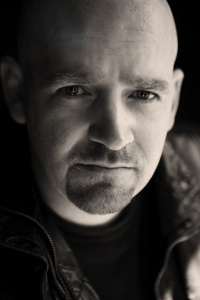 Michaelbrent Collings is a writer and bestselling novelist and one of the top successful indie horror writers in the United States. He is also a screenwriter, with such credits as Barricade, Perception, and Darkroom. In college, he entered the Nicholl Fellowships, a prestigious screenwriting competition, and had four of his screenplays make it to the quarterfinals and semifinals, which opened doors for him. Collings is a member of both the Writers Guild of America and the Horror Writers of America. He was a lawyer before turning to writing full time. He sold his first story to a newspaper at the age of 15. He is the son of writer Michael R. Collings. There’s a split in horror. One kind of horror celebrates evil, and it knocks you into the gutter and it kicks you around and then leaves you there. . . . I don’t want to judge people that like that, but that’s not for me. The kind of horror that I like is the kind that kicks you even deeper, it drops you into a hole, into an abyss, and on the way down it slices everything off of you . . . everything you thought was important. And it leaves the core values that you hold, and then it shows you that that is sufficient to climb back up to the light. And sometimes, depending on the writer, it shows you that just humanity is good enough, and sometimes that that climb requires grace; it requires very literally some kind of intervention of holiness. Collings is the author of young adult and middle grade series The Sword Chronicles and The Billy Saga and standalone titles Killing Time; Hooked: A True Faerie Tale; and The Ridealong. He has written numerous novels, including The Haunted, The Loon, Run, Apparition, and The Colony Series. He is a multiple Bram Stoker Award nominee. Collings and his wife are the parents of several children, including a daughter who passed away as a child. All my books tend to be about family … because I realized how much families really matter … and that is heavily informed by the fact that I hope to see my daughter again (and) that I hope that my family never has to go through this again.